Australia is as famous for its unique animals as it is is for its unique landscapes and sights. Whether you’re taking the kids to visit Australia to check out kangaroos and koalas, or to go on a walkabout in the Australian Outback, know that there’s more to Australia than just flora and fauna. 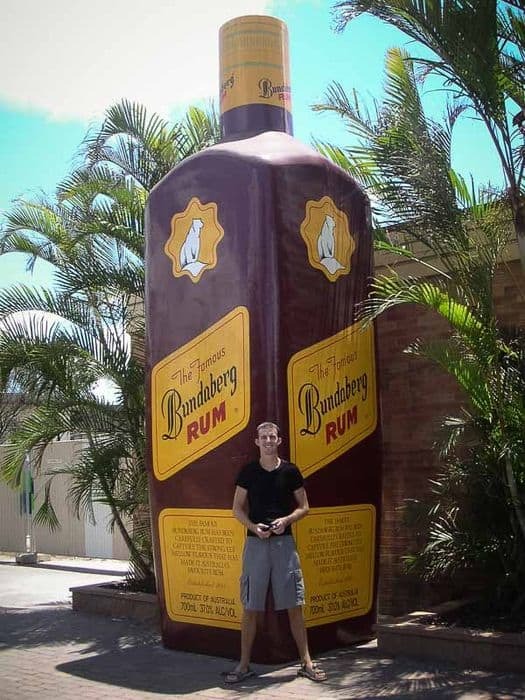 While Uluru (Ayers Rock) and the Great Barrier Reef are obvious places to take the kids, Australians have also taken it upon themselves to produce some of the biggest roadside attractions in the world. With over 150 documented big things in Australia, you could say that creating big things is a defining Australian cultural phenomenon. Where else can you see everything from a 56 foot tall lobster to a 40 foot long banana? 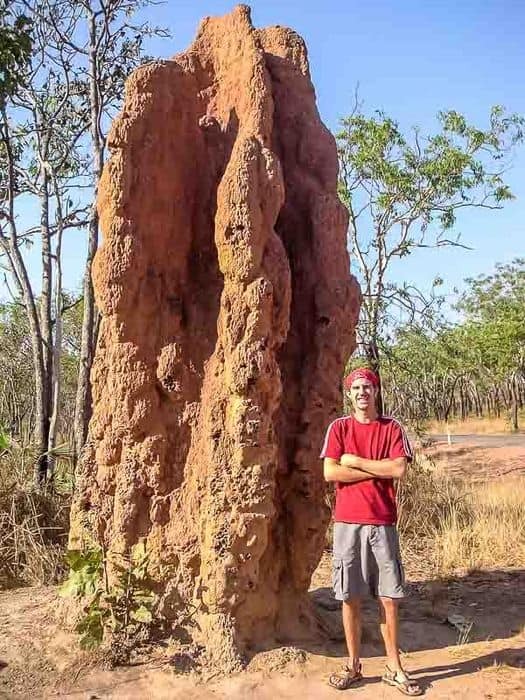 I can’t think of too many kids who wouldn’t love walking through a giant banana or checking out a 15 foot tall termite mound. When we drove our used campervan across Australia for six months, we had the good fortune to see many of Australia’s big things up close and personal. 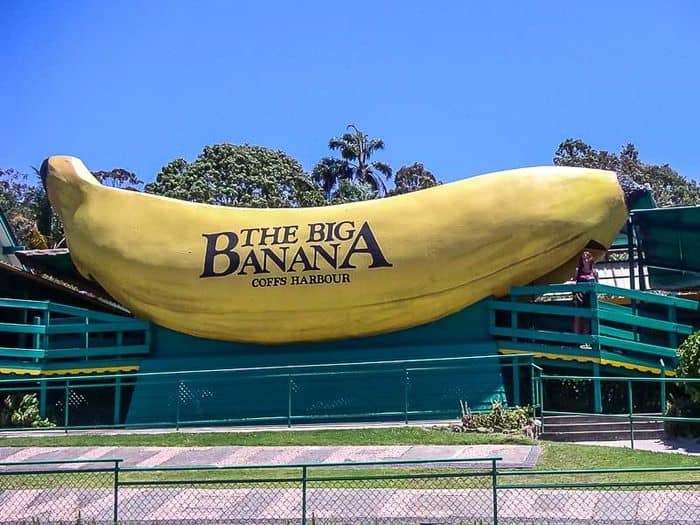 Considering the vast spaces that comprise Australia, these kitschy attractions made great way points while driving from place to place and made for some funny pictures, plus they’re a great way to save money. A campervan is a fantastic travel option for families in Australia. Hotel rooms can be expensive, and driving your own campervan lets you stop at all of the fun big things alongside the road. Plus, it lets you take advantage of Australia’s great tourist and camping parks, and it’s a comfortable way to travel with kids. A campervan lets you stop and use the washroom whenever you want, and it’s great for whipping up quick snacks and meals for the kids. Years later, we still remember certain travel memories in relation to the closest big attraction while we traveled across Australia. Like checking out that pineapple farm just down the road from the Big Pineapple that had these amazingly tasty dried pineapples and who’s owners guided us to this farm down the street that had an elusive platypus swimming in the little creek that flowed through their yard. Since Australia is such a big country, taking a RV, trailer or campervan across the island continent with kids is the best way to not only see the country but to check out Australia’s biggest attractions. Now that our kids are old enough to really enjoy it, we’ve been reading travel tips and planning our next Australian road trip and getting the kids take on things to do. You can bet that between searching for kangaroos, koalas, and wallabies we’ll include stops at the playground under the Giant Mushroom as well as photo ops with both the Big Boxing Kangaroo and Larry, the Big Lobster. We’ll also search out known platypus feeding spots along the east coast, giant blue cassowary parks in the Blue Ranges, jumping crocodiles in Northern Australia, hidden wild camels in the Outback, elusive tree kangaroos and rock wallabies in Queensland and fairy penguins around Perth. Australia’s a big country, so it can take a considerable amount of time to drive around and see all 150 plus big things. In fact, it takes 14 or more days to drive around all of Australia. To enjoy this trip to the upmost, and keep it from getting to be overwhelmingly long, consider hitting only the big things that you want to see most, or constrain yourself to a specific area of Australia. 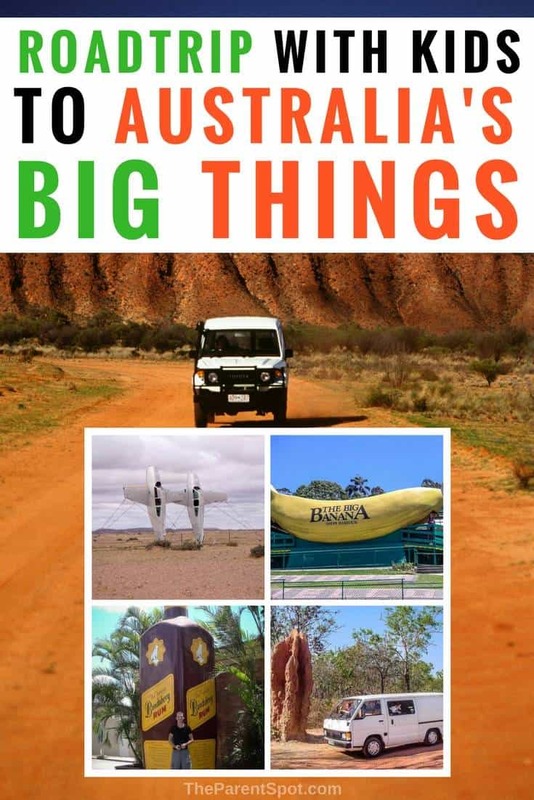 Here is a list of big things you can find in Australia, to give you some inspiration for your own family campervan trip. Some of these big things in Australia are even considered folk art, but they all make a fantastic excuse for a road trip, and a fun backdrop for family photos. Our kids picked out their very own favorites: Ploddy the dinosaur, and the giant bulls, but your kiddos will probably have their own favorites. Our family can’t wait to jump in the campervan and hit the road in Australia!